This exciting We’re Going on a Bear Hunt Activity Pack is full of differentiated worksheets, games and craft activities to complement We’re Going on a Bear Hunt by Michael Rosen and Helen Oxenbury. Great for supporting teaching of nature vocabulary, prepositions of movement, people and family vocabulary, as well as useful story language, including semi-fixed expressions such as ‘be going’, ‘have to’ and ‘can’t’. At the same time, learners develop fine motor skills, literacy skills, social skills and understanding of the world. SEE PREVIEW FOR CLOSE-UPS OF COMPLETE CONTENTS. * Coloring sheets – There are 4 different sheets to choose from. 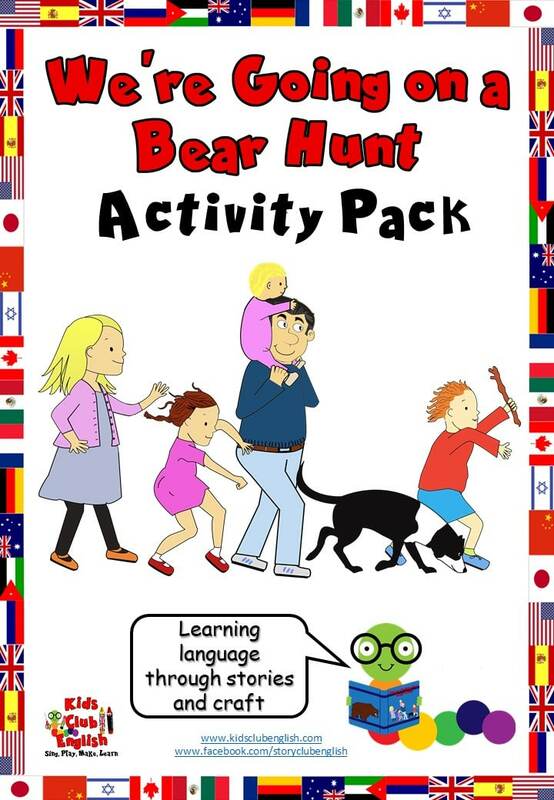 See the activity suggestions for fun interactive ways to maximise language practice. * Sort by size sheets – Children develop beginning maths skills while practising people or family vocabulary. * Small world play craft – A simple and effective craft to create your very own bear hunt landscape. 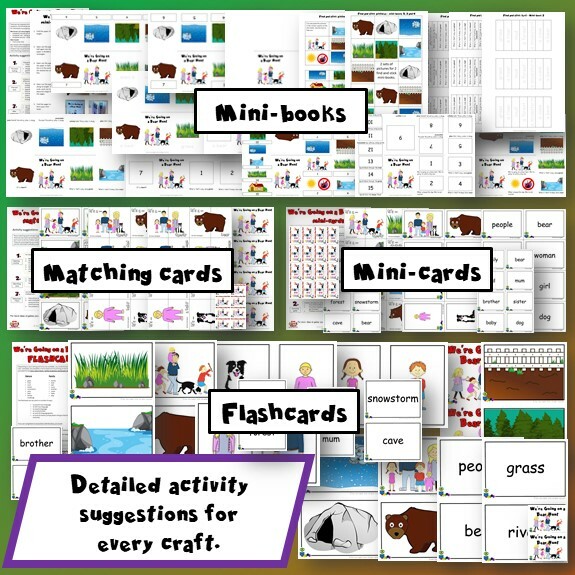 See the activity suggestions for lots of great ideas on how to maximise language practise through both making and playing with this fun craft. * Storyboards – Choose from several variations of these storyboard templates. Ideal for differentiating according to different needs and abilities. There are versions with and without text, tracing options and interactive find and stick possibilities. * Jigsaws – Choose between three different difficulty levels – 15 piece, 9 piece and 5 piece jigsaws. Follow the activity suggestions for inspiration on ways to maximise language practise and include dynamic elements. * Story slider craft – A great story retelling tool that kids can make to practise sequencing skills, while consolidating language from the story. Perfect for sharing with families. * Magic folding book – Kids will love making the hidden bear image appear with this exciting craft. Great for consolidating key language and story retelling too. * Graphing dice and graphing templates – Choose between 3 different dice – story nature elements, family/people or both. Make them up before class or get the kids to make their own. Once assembled, follow the activity suggestions to play fun games while practising the target language. * Bear marionette – A simple marionette that you can use to revise body vocabulary and have fun playing with. See the activity suggestions for ideas. 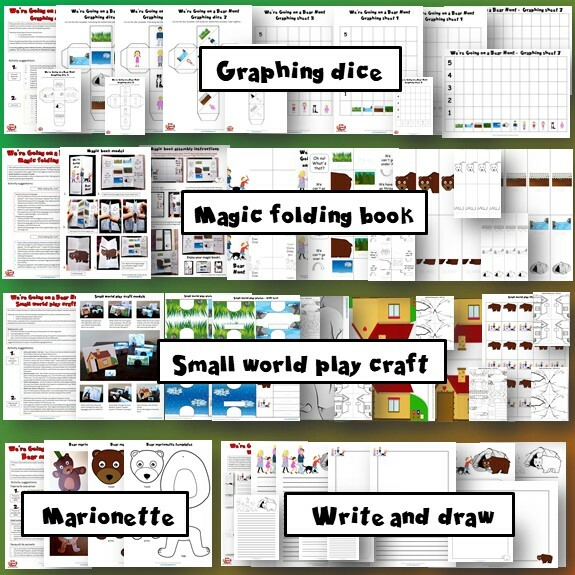 * Mini-books – Choose from 10 separate versions of this mini-book to suit the needs of your specific learners and context. Some versions involve literacy work, others are more suited to oral comprehension or productions activities. All of them great options to revisit and practise language from the story. * Mini-cards – Excellent for a range of games and matching tasks. Sets include nature elements, family and people vocabulary. Print multiple sets for pair and small group work. The above images demonstrate what is provided in this pack. Download the preview for a closer look at the pack contents: Download Preview The entire pack contains 205 pages of information and resource templates! See the preview for the SUGGESTED LANGUAGE FOCUS and the complete list of vocabulary items included in the card sets. Please note the We’re Going on a Bear Hunt story is not provided with this resource but is available in major book stores. 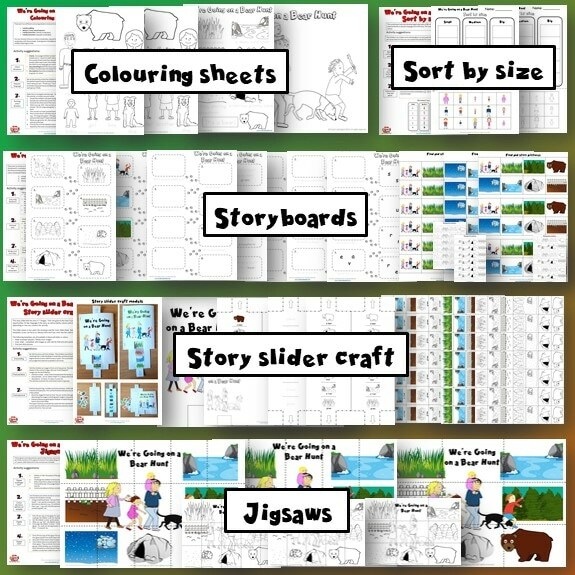 You can also access collections of storytelling videos on our We’re Going on a Bear Hunt Story Resource Page. There are also lots of other related songs there too!